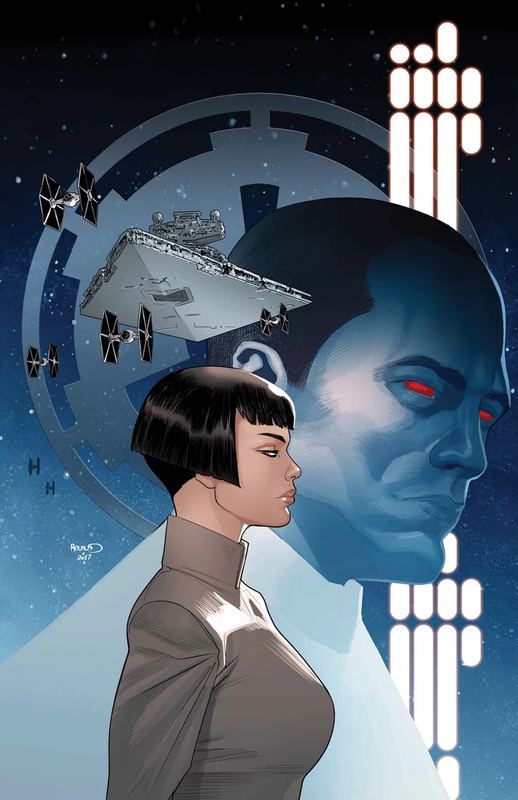 Thrawn #3 takes a break from the title character to focus instead on Arihnda Pryce. With almost no action in this issue whatsoever, it’s a very dialog driven comic. There’s also nothing extra from the book aside from the imagery. As an adaptation, it walks the line in the middle, so I’m not sure how much it has to offer anyone. With a story that sticks very closely to the book, the only thing readers will gain from this one is the imagery. If you’ve read the book, then this is just a refresher of the story with the added bonus of pictures. Even then, the art isn’t anything jaw dropping. It’s interesting, with the coloring feeling very 80’s like without the use of modern lighting and lush coloring. On the plus side, it’s no longer going for the dot colored look. Overall it’s not a bad style, but with the story offering nothing new, it thus leans very hard on the artwork as the reward for readers who have already checked out the books. As such, the reward really isn’t worth the cover price. Honestly, the only way I’d recommend the Thrawn adaptation so far is if you didn’t read the book. In that case, this gives you a taste of what it was like, and if it catches your interest, you can dive into the book to get way more out of the story. In trying to adapt the book, there’s a lot they have to leave out. On the other, there’s a lot they have to include, and that means the entire Arihnda Pryce subplot. The book does a great job of exploring her character, thus giving people a lot more to consider when watching Star Wars Rebels and seeing her in that show. She has an entire arc in the book showing her slow slide into power and corruption. Thus Thrawn #3 introduces her character and compacts a good chunk of her story all into this one issue. As such, there’s not a lot of Thrawn in this one. With only a couple more issues to go, there’s still a lot of the story left for them to tackle, and I can’t see Pryce getting another dedicated issue. As is, I give this one a two and a half out of five metal bikinis. Keep in mind, that’s a bias from someone who has already read the book, so this story didn’t have anything new to offer.